A trek to nature’s wonderland and back! This is no travelogue and does not provide accurate directions to visit Vasota. It is just a web weaved with words by a lover of nature and history. It is the ranting and raving of a mad poetic heart. Technically, it is the output of a machine whose input is the haunting Vasota. This is what I feel it is. For pro-accuracy people, this is my interpretation, go take a hike (literally and that too, to Vasota!). Even after this, you consider this a travelogue, its your loss or gain, as you see fit! This legend left on a metal sign by Giribhraman Sanstha tells you the importance of trekking to the lofty heights on Vasota. Although not a difficult trek, it is one of the most thrilling and enchanting treks in all of Maharashtra. The first glimpse you catch of Vasota is when you are approaching Bamnoli by S.T. Bus. Its spell binds you. As the bus twists and turns on the road down to Bamnoli, Vasota makes you twist and turn in your seat just to continue getting that one glimpse of it. Vasota stands tall amidst the evergreen forests of Koyna Wildlife Sanctuary and mesmerizes you with its beauty. Each contour and fold of the Vasota mountain enhances its beauty many times over. It looks like it has broken free of the shackles of the earth and it is intent on kissing the blue sky. The boat ride to Vasota is engaging and bewitching. The blue-green expanse of the Koyna backwaters makes me want to jump off the boat to swim and splash in its cool depths. But I know that if I jump in the others will want to jump in and then I have to keep my appointment with Ms.Time too!The water is covered in ripples at times while at other moments it is glass-smooth and makes you marvel at the wonder called wind. At times the water is glass smooth and again it has ripples the next instance! 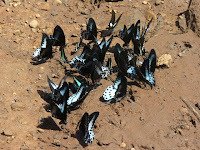 You are greeted by scores of butterflies when you reach the banks of Met Indavali. I have never seen so many butterflies at one place before. All sizes and all colours in one place! Walking up a small path you come to a camp set up by the Forest Dept. It is complete with tents for tourists and trekkers like us. Some of the tents do resemble those that were shown in the movie Border and have taken on the red colour of the earth but we got a huge Shamiana at our disposal which reminded me of a military camp right out of any periodic TV serial. One of the attractions at Vasota is the Shiv Mandir in a cave inside the Nageshwar Pinnacle. Water drips on to the Shivlinga here from a crack in the ceiling throughout the year. No source of water at the top of the pinnacle but its just the rain water which is rationed by nature to drip all year long! We opted to visit Nageshwar before Vasota contrary to others who normally proceed to Vasota first. On the way we first came across a Hanuman & Ganesh temple which is recognizable only because of the two carved idols and the plinth on which they stand. Hanuman & Ganesh Idols together. The only other place I have seen this phenomenon is Kalavantin Pinnacle near Panvel. No walls and no roof remain. Once you enter this area it is like you have come into an air-conditioned room! It becomes cold and shields you from the searing heat of the Sahyadri sun! To the right of the idols is a dried-up stream. Although it is dried up now the stream must be a roaring-monster during the monsoons. All the greenery in and around the stream makes this evident! There are some pools in this stream which offer you naturally refrigerated water. Follow this rocky stream and you feel like you are walking through nature’s own wildlife exhibiton! After much walking we reached the base of Nageshwar pinnacle and from there we get a breathtaking view of Vasota and Old Vasota. The folds and contours on the mountain of Vasota coupled with its sheer cliffs give it the look of a muscular warrior!! The view of Konkan from the point was also awesome! After climbing a few steps we reached the Nageshwar Cave temple. Cool breeze greeted us as we reached the temple. It is a hot favourite spot for pilgrims during MahaShivratri and one can clearly see the incessant drop by drop dripping of water over the Shivlinga. It was getting dark and we had to use torches for the last kilometer or so but the more thrilling part of that last mile (or kilometer i must say!) was when we switched off our torches and stumbled and found our way out of the jungle!! Our night-time was pretty much occupied by the regular food-making operations and other such things. But the highlight of the night was the camp fire where we had our dinner, told dirty jokes aloud, laughed raucously like wild, bearded stone-age men and then dozed off to snoring equally fast! Next day we had scheduled a lightning fast climb to Vasota and an equally rapid descent from the fort, the reason being time again! The climb was once again awesome and never ever tired us because the entire path has forest cover over it! There are some patches where the vegetation over-head is so thick that the sun-rays refuse to touch the forest floor!! Once we reach the top of Vasota we come across a Bhagwa Flag fluttering in the wind.It fills you with energy!! It makes you even more enthusiastic to climb the remainder of the fort and explore it! As you climb the steps of Vasota’s main entrance you cannot help but feel sad for the bad condition of the fort neglected by people and the government in general. The bastions and gates destroyed by the Britishers when they captured the fort still take you back to those days. It spurs you on! Makes you feel you are the King of the world! Makes you proud of yourself and gives you the satisfaction of having achieved something! The forests on top of Vasota are thick and have grown over the ruins of the fort rendering access to the interiors of the fort almost impossible. But one can still see the foundations of many mansions on the fort. The only completely standing structure on the fort is a Mahadev Temple. It has a photo of my god, Shivaji Maharaj, inside it. From here a splendid panoramic view of the Konkan region can be seen along with the Nageshwar pinnacle!! The other end of the fort joins Vasota to Old Vasota via a narrow ridge and of course, the famous Babu Kadaa! Babu Kadaa( unlike its baby-ish name!) is a steep and tall cliff which reminds you of a very strong stone wall, only that it is natural! Babu Kadaa is the second steepest cliff in the Sahyadris, the first being Konkan Kadaa! The view from Babu Kadaa makes you speechless!! Just speechless!! Old Vasota sits like a king on top of Babu Kadaa. It has been stated as being out of bounds by the Forest Dept. We are like grown-up children. Denying anything makes us want it even more! Old Vasota laughs at you. It taunts you! In your face pathetic human!! You cannot conquer me! The way to me is lost! You cannot walk on my sacred ground and defame me with your pathetic name writing and plastic garbage!! I stare at its old fortifications covered in vegetation. I feel helpless, frustrated. I’ll be back old man! With more time and more people! And I will find the way through to you because I know it exists! And whats more I will bring you to your knees by walking on your sacred grounds! I will unveil your mysteries!! You cannot deny me entry, I am born of these great old mountains. I will come to you! We finally descend Vasota and return to base camp. As we bid adieu to this grand old fort duo we find it difficult to move our eyes away from them until the boat turns and the forts disappear behind a hill. They do make a re-appeareance when you are travelling to Satara but that is for only a brief period of time, just to say a final good-bye! Until next time my old friends! We shall meet again, I say! PS: Please click on the photographs for an enlarged view. Trust me, its worth clicking on them! Very Good…described it very well ! superb ! This will be the ‘must to read’ kinda blog for all Vasota pursuers !!!!!! Congratulations! 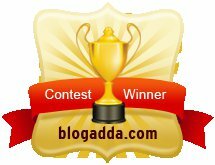 Your post has been selected by BlogAdda as one of the top posts for this week’s ‘Spicy Saturday Picks’. 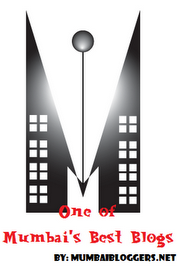 Please send me a mail at harishkrishnan(at)blogadda.com as we have something for you..! Reading this has made my curiosity for this place increasing. And I have made my mind to explore even the old vasota once before i say good bye to the this world. After reading this we have decided to trek to Vasota. Thank you very much! do find out the details and then go! Now is the right time to go to Vasota! Very well written man !!! According to me, that route to nageshwar & David’s Company was d best.